Above: Photo by Baxter Miller. Editor’s Note: This story was updated Jan. 23, 2019 to reflect damage tallies through late 2018. In early August 2018, state, federal, university and community partners announced the new North Carolina Shellfish Initiative to support a variety of efforts to grow more clams, oysters and scallops by promoting aquaculture and shellfish restoration. Less than six weeks later, initiative participants added disaster recovery to their tasks after Hurricane Florence brought record flooding to the state. “This is the partnership in action,” explains Chuck Weirich, North Carolina Sea Grant’s marine aquaculture specialist. By late 2018, his survey of damage assessments by shellfish growers suggested losses from hurricanes Florence and Michael were nearly $10 million, with significant impacts to facilities, gear and crops. Weirich is part of the team that had developed the Shellfish Initiative along with representatives from North Carolina Sea Grant, the National Oceanic and Atmospheric Administration, N.C. Departments of Environmental Quality. Commerce, and Agriculture and Consumer Services, the N.C. Coastal Federation, and the N.C. Shellfish Growers Association. “Over the last 15 years, the state has garnered public attention with significant investment in shellfish restoration in addition to growth of shellfish farming. NOAA is pleased to partner with the state by contributing tools and expertise for siting shellfish farms and oyster restoration projects, which increase opportunities to sustainably harvest shellfish,” says Ken Riley, a marine ecologist with NOAA’s National Centers for Coastal Ocean Science. At the announcement event held at the NC State University Center for Marine Sciences and Technology, the partners cited four goals for the initiative: job creation, protection of water quality, protection of shellfish health and sustainable management. 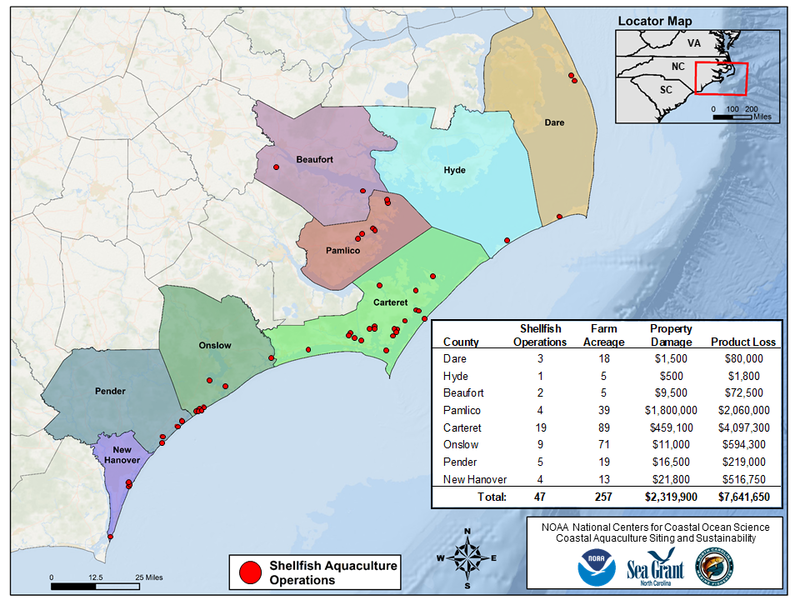 Since Hurricane Florence, Riley and Weirich also have focused on business and job retention as they collaborate to document damage for the state’s mariculture industry, which has seen tremendous growth in recent years. “In particular, the state has seen an increase in water-column leases that allow growers to use culture gear such as cages to produce single oysters for the coveted half-shell market,” Weirich explains. This helped push the farm-gate value of the N.C. oyster aquaculture industry over $1 million for the first time in 2016. In 2017, that value doubled to over $2 million. The state also has a rich history of farming hard clams. Sea Grant is leading research to look into the potential for adding N.C. native sunray Venus clams and bay scallops as cultured species. Hurricane Florence brought record­ setting rain not only in the coastal region but also inland, which meant the flush of freshwater into estuaries — and into shellfish farms — continued for weeks. That flow reduced salinity and dissolved oxygen levels, leaving poor conditions for growing oysters and clams. 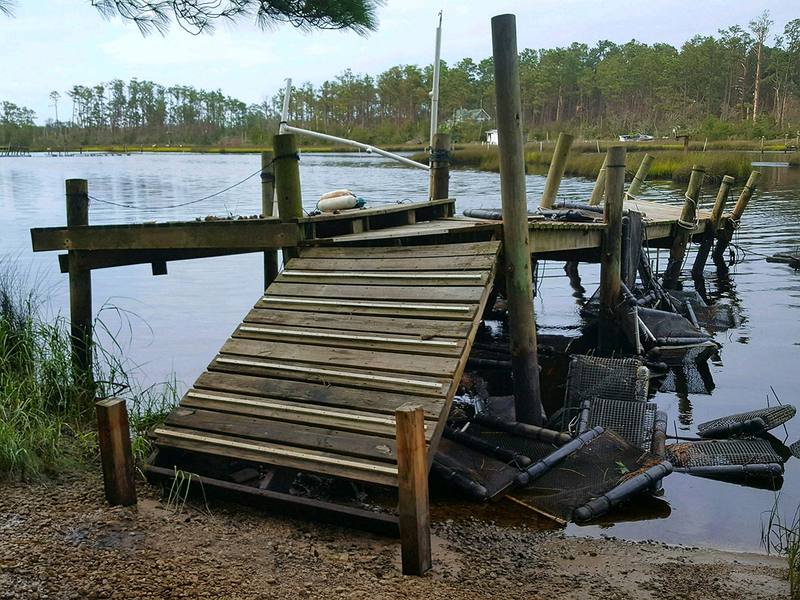 Powerful waves and storm surge also hit docks, sorting facilities and gear, and caused severe damage at shellfish hatcheries and nursery facilities. “All 47 farms that reported had significant damage and a few farms had catastrophic losses,” Weirich said in early 2019. Also, some farms that had fared well through Florence had damage in October when Michael came through with tropical-storm winds driving waves and rain. For example, Carteret County had 19 shellfish aquaculture businesses reporting losses, the highest count for any county. Pamlico County had the highest dollar losses, with $1.8 million in property damage and $2.06 million in lost product. Carteret County reported the most impacts to total farm acreage at 89.
Business recovery efforts are ongoing. In November 2018, the shellfish industry was celebrated by a series of stories in Our State magazine, a package that had been in the works for a year. Weirich and Riley hope the photos and stories will keep the industry on the minds of consumers across North Carolina and beyond. This article was updated with new figures on January 24, 2019. The original version of this article was published in the Autumn 2018 issue of Coastwatch. For reprint requests, click here.